Wander along narrow streets shaded by vintage brick storefronts. Uncover treasures in an antique store before savoring a pint of delicious craft beer at a local brewery. Enjoy a night out in one-of-a-kind bars listening to live music, then hang your hat in a historic hotel. All of these experiences await in Downtown Bryan, the cultural and culinary capital of the Brazos Valley. A Texas Cultural District, this part of town is an especially great place to visit in the spring, when the friendly weather makes all the window shopping and exploring you’ll do even better. Read on to see a few reasons why you should plan a visit to Downtown Bryan this spring. If all that spectacular springtime sunshine isn’t enough to get you strolling and window shopping around Downtown Bryan, the season’s festive events certainly will reel you in. It all kicks off with the Downtown Street & Art Fair (April 14), when you can listen to tunes of local bands as you browse the handmade wares crafted by regional artists. Love craft beer? 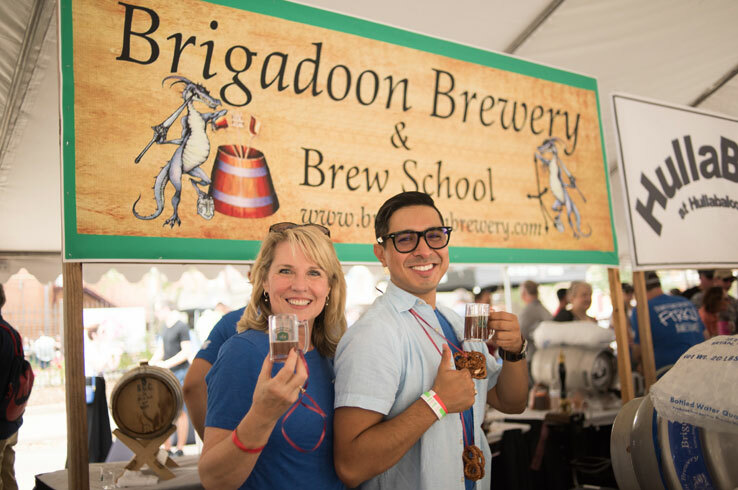 Try one-of-a-kind unfiltered brews fermented in small, wooden casks (firkins), with spices, fruit, or extra hops added during the process at the Downtown Bryan Firkin Fest (April 28). 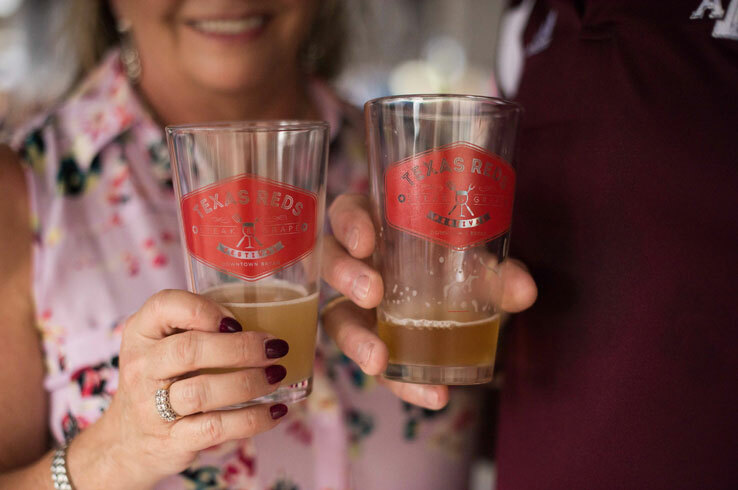 A celebration of beer, the festival offers a tasting adventure across Texas as the festival brings in breweries from across the Lone Star State. While both of these events are great reasons to visit Downtown Bryan, that’s not all that’s going on here. Stroll along the downtown area’s streets as you listen to street musicians, watch magic acts, and check out all the fantastic art during First Friday, a free event held on—you guessed it—the first Friday of each month. Meanwhile, take your pick of locally grown produce and other goods every Saturday morning at the Brazos Valley Farmers Market. Each of these events serves up a treat for all of your senses while also being a heck of a lot of fun. So, what are you waiting for? Bonus: Don’t miss the grand opening of the Queen Theatre on May 4. This historic building and architectural mainstay in Downtown Bryan will screen classic films two weekends every month. What’s better than the feeling of gloriously warm spring sunshine? Pairing that sensation with a pint of your favorite style of craft beer, of course. Downtown Bryan is home to two stellar places that brew up their own beer: Blackwater Draw Brewing Co. and the Bryan College Station Zoigl Brewery. The B-CS Zoigl Brewery provides one of the most unique beer-drinking experiences around. Essentially a brewer’s co-op, this beer garden is the place to go to try new and exotic ales and lagers you won’t find anywhere else. At Blackwater Draw, you can relax with a pint of something light or dark, ranging from an American IPA to a coffee porter before going on a behind-the-scenes tour of the brewery, a real treat for you home brewers out there. Whether you’re a craft beer enthusiast or you just love a good beer, there’s plenty to savor in Downtown Bryan. 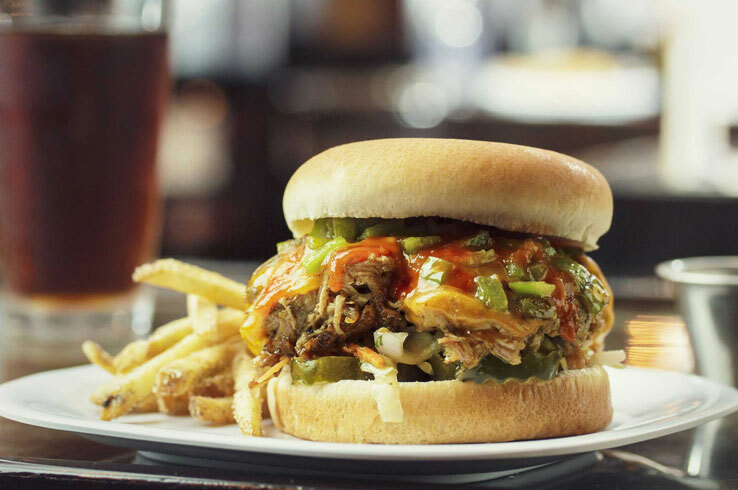 From delicious handmade enchiladas and giant slices of piping-hot pizza to inventive burgers and locally made chocolates, Downtown Bryan has just about anything you’re in the mood for. For south of the border staples, cruise on over to Casa Rodriguez, a local favorite for Mexican and American fare that even has gluten-free options. Must Be Heaven, on the other hand, pairs its old-fashioned charm with a menu of straightforward eats and its selection of show-stopping pies. Don’t leave Downtown Bryan without stopping by the Chocolate Gallery, the ultimate place to indulge your sweet tooth with something (or several somethings) made on-site. This is just a taste of the many restaurants in Downtown Bryan. See some of the other options here. Downtown Bryan is a destination for artists and art lovers, and one of the best ways to admire the local art is by basking in the sunlight as you wander from one gallery to the next. Admire the collection of blown glass art and jewelry at Brazos Glassworks, which also offers classes if you’re feeling creative. The Purple Turtle Art Studio also gives you the chance to make something of your own, as it provides classes for both youngsters and adults. Hunt for one-of-a-kind finds in the several antique shops in the area, then drive down to West 31st Street to marvel at the larger-than-life murals that showcase Bryan’s culture and history. 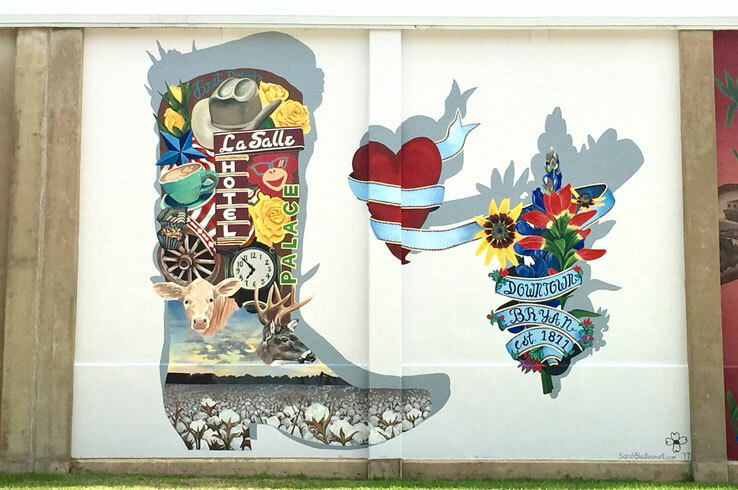 Not only are these murals great for selfies, but you just may learn a thing or two about this corner of the Lone Star State. Blues, jazz, hip hop, and rock and roll: you name it and you’ll likely hear it in Downtown Bryan. Catch an intimate acoustic performance at Revolution Cafe & Bar, a bohemian hangout with 75 craft beers and a selection of signature cocktails to choose from. 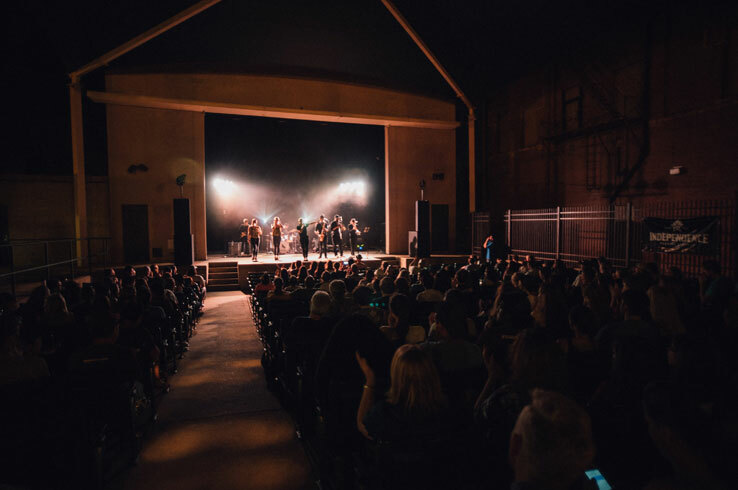 To experience a concert outdoors, catch a show at the Palace Theater, a former movie theater built in 1928 that is now a sprawling open-air venue. Downtown Bryan’s other main venue, The Downtown Elixir & Spirits Company, is an upscale bar and restaurant on the first floor of the historic La Salle Hotel that hosts live music every weekend. No matter where you end up, you’re guaranteed a great show by some of the best musicians in the Brazos Valley. These are, of course, just five of the reasons you should visit Downtown Bryan this spring. Find out more about what this Texas cultural district has to offer here.